MUERTAS PART 3! Lady Deathstrike’s new Sisterhood set their sights on the X-Men, and Psylocke is in the crosshairs! A foe awakens…and neither team might be able to handle her! 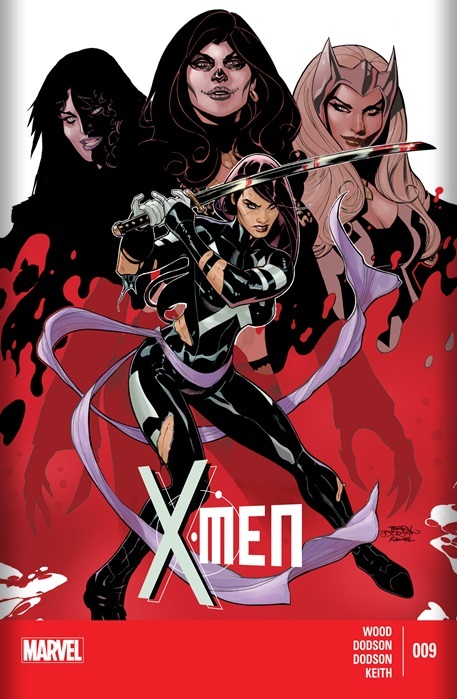 Cover-A battered and bloody Psylocke prepares for an attack while Lady Deathstrike, Enchantress and Typhoid Mary gloat in the background. It’s neat, to the point and illustrated by the Dodson’s. I like it! Villains– I’m digging the sisterhood. The new Latino Lady Deathstrike, the Asgardian Enchantress, Daredevil’s Typhoid Mary and Arkea the computer virus? Hell yeah! Arkea shows just how much of a threat she really is by merging Typhoid’s personalities, upgrading Yuriko and allowing Enchantress access to her magic. This kitty cat has some serious claws and huge potential! Art– The Dodson’s are on art duty and everything looks great. I honestly can’t complain about anything. Budding Romance– Just what the hell is going on with Rachel Grey and John Sublime? Talk about a bad romance! Black Heroes– This issue Monet displays her near invulnerability and super strength by literally tearing through a building. Decent feat for Monet and it’s great to see her powers really just in your face like that after the often reserved manner Peter David used her in X-factor. Costume-So this issue Sabra shows up….and Monet gets a new costume…..but they look VERY similar. Did we run out of costume ideas or were we feeling lazy this month? A quick flip through the book you could easily get the two confused. Just based on the action you described of Monet I want to check this one out myself (if I get a chance). Thanks! Nowadays you can just grab a digital copy instead of tracking it down in a store which is a lifesaver!